Below, my article, as published last week on the Guardian – my first article on what is arguably the world’s foremost news media source for environment and climate news and opinion. Having been banging on about these issues domestically for years, and trying to draw attention within the national media on Ireland’s generally woeful performance, (as well as the rise of organised climate denial) in recent months I changed tack and began looking at non-Irish media outlets. Since May, I’ve had a total of four news features published on DeSmog.uk, a leading site focusing on identifying and calling out climate denial in all its many guises. From there, I approached the Guardian earlier this month and this led to the below piece being commissioned (ok, to fess up, I’ve been knocking on their door, on and off, for around three years. These things clearly take time, lots of time). It appeared on Guardian.co.uk last Wednesday morning, and spent almost the entire day ranked as first or second on the ‘most read’ list on Guardian/Environment. To date, it has garnered almost 30,000 views just from Ireland, as well as 530 comments posted online under the article. And finally, the inevitable article about the article, on Joe.ie no less. Reaction among the agribusiness lobby has been, let’s say, not warm, with dark mutterings in some corners that my writing about this in an English publication somehow smacked of colonialism (pull the other one, lads). Having painted itself into a corner on beef/dairy expansion as the cornerstone of agri policy for at least the next decade, this group now seems to feel it has no choice but to rubbish anyone who dares to point out that, however you slice or dice it, this is an ultra-high emissions road to failure. That beef is also failing to even deliver a basic living for most farmers is another inconvenient fact that seems to attract a frenzied reaction when pointed out. ON THE FACE of it, Ireland appears to be acting on climate change. Last year it appointed its first ever “climate action minister”, and in June it outlawed onshore fracking. What’s more, the telegenic new taoiseach Leo Varadkar dedicated much of the first day of his Cabinet retreat to discussing climate change. Last week Varadkar introduced Ireland’s first national mitigation plan (NMP) in more than a decade, and said that addressing climate change would “require fundamental societal transformation and, more immediately, allocation of resources and sustained policy change.” If success could be measured simply by repetition – the word “sustainable” appears no fewer than 110 times in the NMP – Ireland would undoubtedly be among the world’s leading countries. But looks can be deceiving. The promised “fundamental societal transformation” turns out to be a soothing combination of words entirely lacking in substance. The climate action minister, Denis Naughten, glossed over the gaping holes and staggering lack of ambition in the NMP by declaring it a “living document”, with the vague understanding that it will, zombie-like, spring to life at some point closer to 2050. Naughten’s discomfort in media interviews was obvious. Ireland was, he stressed, “playing catch-up” and perhaps shouldn’t be judged too harshly. Naughten is adamant that the government doesn’t want to be prescriptive on how to hit our targets. But in practice, this translates into ducking the tough but necessary near-term decisions. Naughten recently pleaded in Brussels that the 2020 targets (of a 20% emissions cut compared with 2005) that Ireland chose to sign up to are too onerous, and threatening to delay EU-wide implementation of the Paris accord. By 2020 Ireland will only have achieved a paltry 5-6% reduction in emissions, with greenhouse gases from transport and agriculture actually rising. The spectre of serious EU fines looms ever closer. Per capita, Ireland’s emissions are the third highest in the EU, and it is one of only four EU states (alongside Belgium, Luxembourg and Austria) expected to miss its 2020 targets. Things may be about to get a lot worse. With no public announcement, on 11 July Naughten’s department issued a licence permitting oil drilling on the Porcupine Bank off Ireland’s west coast. Some 5bn barrels of offshore oil may be recoverable, which, when burned, would release 1.5bn tonnes of CO2 – the equivalent of more than a quarter of a century of Ireland’s current total emissions from all sectors. Irrespective of whose balance sheet this oil ends up on, issuing such a licence is “complete doublespeak” and shows “inconsistency and incompetence”, according to Green party senator, Grace O’Sullivan. While the Porcupine Bank oilfield presents a prickly political problem for a government claiming to take its climate obligations seriously, its real challenges are closer to home; first, in the transport sector where a lack of strategic planning means emissions are set to spiral by 14-16% by 2020. Second, government agriculture strategy is set out in Food Wise 2025, a policy document unashamedly drafted not by civil servants but by the food industry. By 2020, agriculture will account for 45% of Ireland’s total emissions outside the emissions trading scheme. The government continues to argue that Ireland’s largely grass-based beef and dairy sector is uniquely climate-friendly and so should not be discouraged. However, a study commissioned by the European parliament earlier this year severely dented this narrative, as it found Ireland had the highest level of greenhouse gas emissions per euro of agricultural output in the entire EU. Ireland’s claim to be a “food island” was further undermined by UN data for 2011, which found it to be a net importer of food calories since 2000. Rather than feeding the world, Ireland isn’t even feeding itself. In fact, most Irish beef farmers are losing money, and only remain afloat due to EU subsidies. Awkward questions posed by domestic NGOs about the impossibility of Ireland meeting its EU-mandated emissions targets as long as the agriculture sector enjoys an emissions “free pass” are met with an increasingly tetchy official response. The agriculture minister, Michael Creed, recently argued that critics of farming emissions were doing a “huge disservice” to the country. Other parts of the industry have taken it a step further, and teamed up to actively promote a new Irish climate denial group. It flew in guest speakers including Richard Lindzen and William Happer this summer to spread doubt on climate science. This denier messaging was then uncritically reported by the farming press. When it comes to a coherent climate policy, Ireland’s turns out to be more greenwash than green. This entry was posted in Global Warming, Irish Focus, Media, Sustainability and tagged Denis Naughten, emissions, Food Wise 2025, Guardian. Bookmark the permalink. Well done John an excellent and timely article! I’ve been thinking lately as a way of promoting ‘joined-up-thinking’ that the EU might correlate its state-by-state quota of refugees with the degree by which the state has missed or exceeded it’s emissions targets?! Too radical no doubt but the cage needs a good rattling! Many thanks Peter! I like your idea of allocating climate refugees based on emissions targets missed. Maybe they could be dispersed to the countryside as well, given the disproportionate contribution of our agri sector? 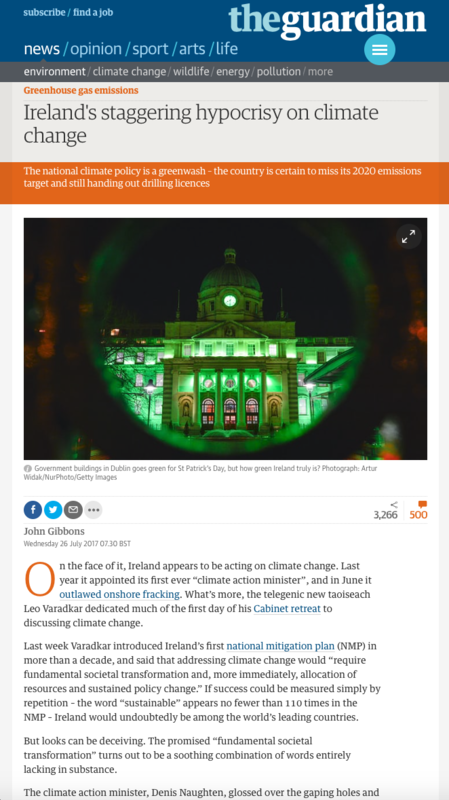 As cage-rattlers go, it’s a good one…and a reminder that ‘climate justice’ is almost entirely missing from Ireland’s national climate dialogue, despite Mary Robinson’s best efforts.